The SLI Compliance St. Patrick’s Day Chili Cook-Off raised over $700 for local Charity, Robbie’s Hope. Robbie’s Hope Foundation was established to remove the stigma surrounding teen depression and teen suicide. The Foundation is focused on providing the tools and resources to enable Student Lead Activism through small group meetings, targeted financial support to highly efficient and effective organizations that specialize in providing therapy to teens, and by integrating mental health into a mandated Health Education curriculum in K-12 schools. 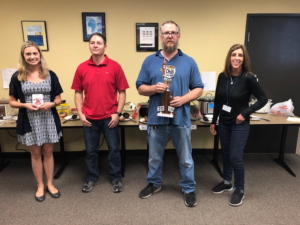 The 3rd Annual Chili Cook-Off consisted of a Red Chili and Green Chili competition as well as a jelly bean count and various raffle prizes.